Rugby Union / The Game-Changer – What follows? The Game-Changer – What follows? It’s instructive to consider some of the points arising from the big game at the Stoop last Saturday, dubbed The Game-Changer. This was the second initiative of its kind that Quins have mounted, and it must be counted a roaring success. Now let’s see why it was needed. 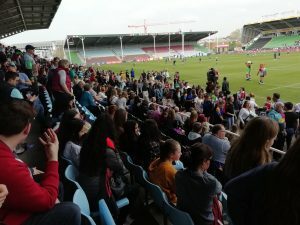 Compare the attendance at the Stoop with Quins’ home game the previous week at Surrey Sports Park. There may be several reasons why the 4,800-odd people who turned up the following week weren’t here: the game was much less widely publicised; SSP isn’t as accessible as the Stoop; watching women’s rugby is not – yet – a familiar way of spending a Saturday afternoon. 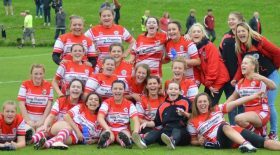 The biggest Tyrrells clubs have the resources to push the boat out, in other words to build a large fan base and, more important, a large group of youngsters who are inspired to follow in the footsteps of the players themselves. This photo reveals not only Ellie Green’s remarkable kicking skills but the size of the crowd in attendance at the Darlington Mowden Park fixture. Shaunagh Brown has said: ‘Everyone outside of Quins knows that we’re the best looked after and run – attendance, training, kit, the lot’. Quins are trendsetters, but can other clubs achieve similar results? They are certainly trying! The same day Wasps laid on a Big Swarm Day to which all players past and present, families, friends and fans were invited. They were hoping to welcome 2,000 people to the event. Saracens too have considerable resources and use them well to engage youngsters to commit to the game. The one thing that the London clubs lack is the community feeling that comes more easily to clubs lying further away from the Big Smoke. This is proved by the attendances achieved by the Red Roses this year: a new stand-alone record of 4,674 at Castle Park Doncaster was more than doubled at Sandy Park Exeter (10,545). 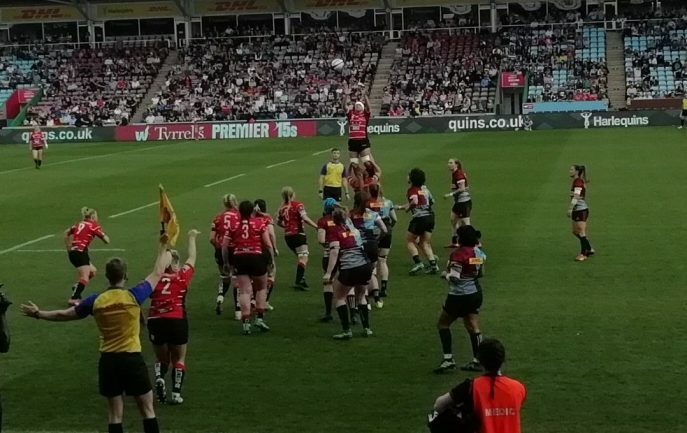 The huge support that Quins attracted has not been reflected in attendances for Red Roses’ matches at the Stoop. The best they have managed thus far is 4,024 for the 2018 game against Wales – not a spectacular figure for a conurbation the size of London. The day selected for the The Game-Changer was the last round of the regular season – an interesting choice. That leaves the two play-off weekends in April to attract the crowds back. The first will be back at the Stoop, the second at the Saints’ ground in Northampton. Let’s hope that large numbers of supporters will make those two trips. After that it’s summer camps and the 2019-20 season. That will be the last of the three planned seasons of the Tyrrells before the RFU has to face some really tricky questions: how to proceed with the tournament; whether to commit to full professionalism; whether to keep the same ten elite clubs; whether to extend the number of clubs competing at this level; whether to introduce promotion and relegation. All of these issues reflect on the standing of women’s rugby in the public’s eyes. The players who have been lucky enough to play in front of a large crowd know the difference this can make to the sense of occasion. Thus far they have been limited to the recent World Cups in London, Paris and Belfast and several tests played in France in front of five-figure crowds. These stand-alone attendances are the acid test. Now England can boast its own five-figure total after the thrilling turn-out at Sandy Park. 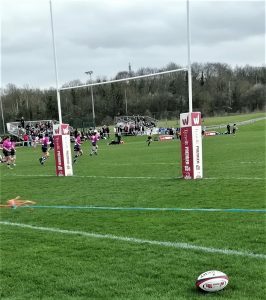 The initiative played out by Quins on Saturday 30 March 2019 has helped enormously to raise its profile. Let’s hope all the ten Tyrrells clubs can see bigger attendances at their home games next year.